These photos were taken by an acquaintance photographer, Mr. Gordon Plumb. Yes, these are copyrighted. The lovely brick church of St Mary's, at Shelton, Norfolk, ENG was started before 1497, when Sir Ralph Shelton ordered in his will that it should be finished. 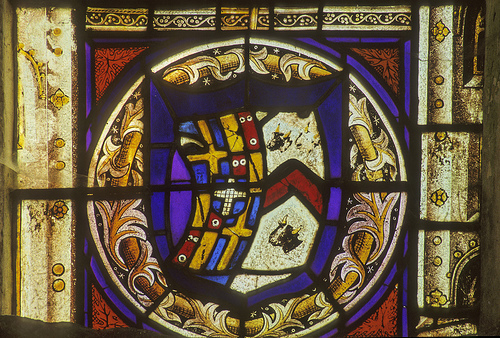 Much of the original glazing survives and seems to have been carried out swiftly, because a will of 1504 leaves money for glass. But it has been re-arranged and earlier and later glass has been added. 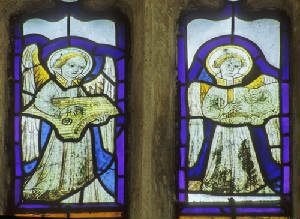 The glass in these windows are examples of early 16th century glass painting done in England by, or under the influence of, North European glass painters. Anglels, bagpipes and portable organ. 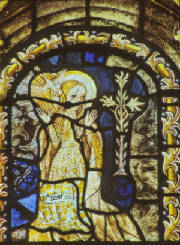 Stained glass window dating pre-1500. 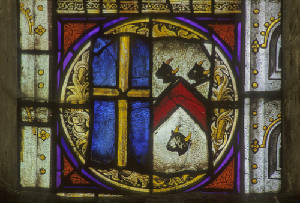 The shield of Boleyn which can just be seen lower left is an insertion of earlier glass. On either side of the altar can be seen Elizabethan tomb-chests, the one on the south side carries shields of the Shelton family. Against the south wall of the south aisle is a Jacobean monument with kneeling figures, Sir Robert Houghton (who died in 1623) and his wife facing each other and two figures of their children in front. Much of the stained glass in the aisle windows dates back to the 16th Century, mixed with faded 19th Century patterns and borders. 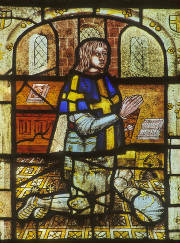 Various members of the Shelton family are depicted in the east windows. 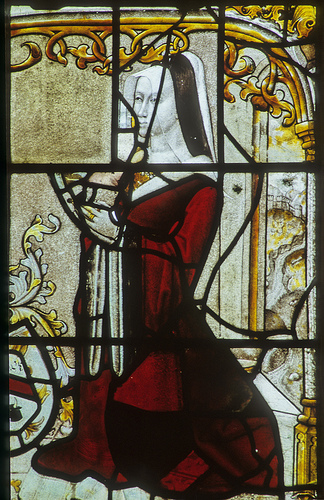 These include Sir Ralph and his wife and their son Sir John, who married Anne Boleyn of Blickling (aunt to Queen Anne Boleyn, the second wife of Henry VIII and mother of Elizabeth I). 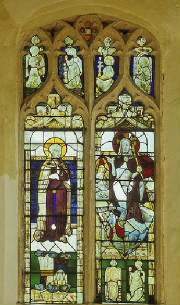 The Shelton coat of arms is repeated in the windows; one can also see the Angelic Host, the Annunciation, King Edmund and Henry VI. The Royal Arms on the wall of the tower are those of William III. 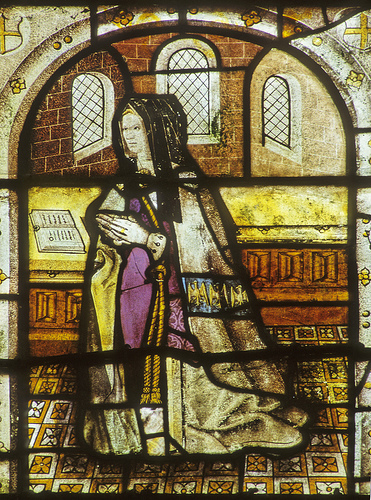 Sir John Shelton’s wife Anne was governess to Henry VIII’s eldest daughter, Mary, while Anne Boleyn was queen. This was not an easy task for, while Mary insisted on being treated as a royal princess, Queen Anne was equally determined that insults should be heaped upon her step daughter and that she should be made to feel her “bastardy”. Lady Shelton was therefore ordered to treat Mary severely and even to beat her but at the same time she was warned that if the girl were to come to any harm she herself would be held responsible. No wonder that Lady Shelton was “not a little frightened” and cried bitterly whenever Mary was ill. Queen Anne’s daughter, Princess Elizabeth, was brought to Shelton in the care of her great aunt and uncle at the time of her mother’s execution in 1536. On at least one occasion, when Sir John feared that court conspirators bore her ill will, Elizabeth was hidden in the church itself. SOURCE: The official SHELTON FESTIVAL held annually at ST. MARY'S Church - Norfolk ENG. To my home page "Virginia Roots"